Suspected US fighter jets were reported to have carried out a new airstrike against Al-Shabaab in southern Somalia on Tuesday night, sources said. The warplanes have fired several missiles at Al-Shabaab bases in the southern town of Awdheegle in Lower Shabelle region, which is situated some 60Km away from Mogadishu. 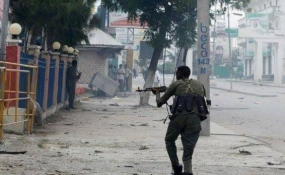 Reports said Somali special forces assisted their allied American troops to carry out the overnight attack targeting Al-Shabab, which caused unspecified casualties. The US military stepped up airstrikes in South and central Somalia since Trump authorized a broader operation against Al-Shabaab, the Al-Qaeda ally in East Africa last year.